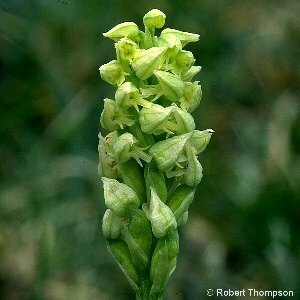 Dense-Flowered Orchid (Neotinea maculata), also called the Irish Orchid, is almost confined to Ireland within the British Isles (but reported once from the Isle of Man). It is a species of southern distribution which has its main centre in the Mediterranean region, but it occurs along the west of Ireland as far north as Counties Fermanagh and Donegal in dry, warm habitats. The flower spikes are composed of densely-packed small pink or white flowers; leaves are spotted where the flowers are pink. The lip is three-lobed with the middle lobe longer than the other two; there is a short spur at the base of the flower containing nectar. All names: Neotinea maculata (Desf.) Stearn; Neotinea intacta (Link) H.G.Reichb. 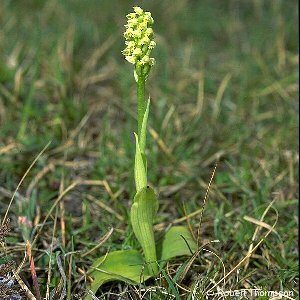 ; Habenaria intacta (Link) Lindl. ex Benth.